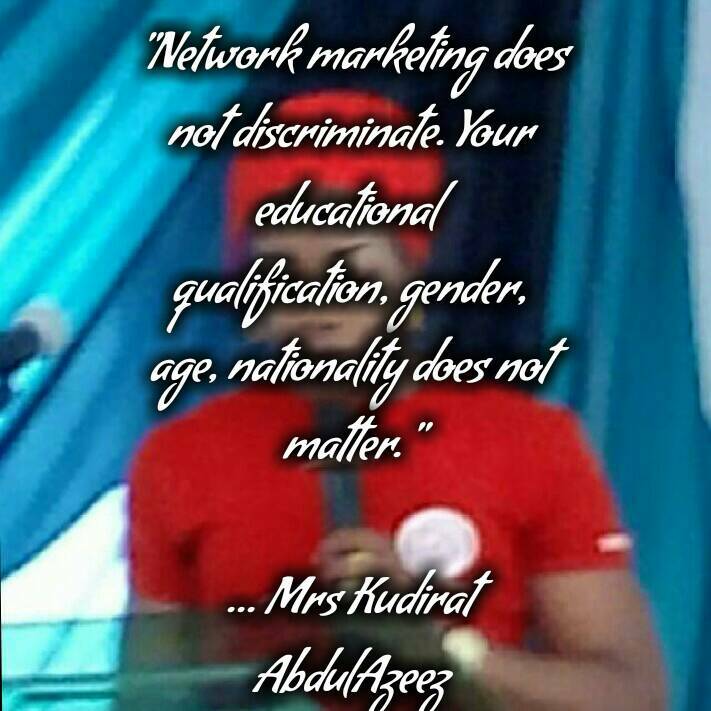 Naija Marketing Pro, this week, as usual, invited Mrs Kudirat Abdulazeez to her community where we looked at, ‘5 secrets that can help you succeed in network marketing in Nigeria.’ Mrs Kudirat Abdulazeez, is a multiple award winner in network marketing business, though a pharmacist by training. Naija Marketing Pro media team and CEO, Ayodeji Oladeji Charles sits down with Mrs Kudirat Abdulazeez, to talk about, 5 secrets that can help you succeed in network marketing in Nigeria. In the interview, Mrs Kudirat explains network marketing, as a very flexible business model where you can earn a full time wage working only part-time hours. Mrs Kudirat Abdulazeez: Good morning all. Yes, let’s roll. Ayodeji Oladeji Charles: Awesome. Thank you once again. Mrs Kudirat Abdulazeez: Thank you for the opportunity. Ayodeji Oladeji Charles: We are grateful too. Can you tell us a little about yourself? Mrs Kudirat Abdulazeez: Of course. My name is Kudirat AbdulAzeez. I am a Pharmacist by profession. I live in Jos, Plateau state Nigeria with my lovely husband and 3 wonderful children. My Areas of interests are reading and empowering people with an alternative source of income. Ayodeji Oladeji Charles: Awesome. Your husband must be lucky to have gotten you and your children are blessed to have a mother like you. Can you tell us, what you know or understand about network marketing? Mrs Kudirat Abdulazeez: Thank you. I think I am the lucky one here. Network marketing is a very flexible business model where you can earn a full time wage working only part-time hours. In network marketing a system exists where products are moved from the manufacturer to consumers directly eliminating middle men which exists in traditional businesses through a network of users, distributors and retailers. Distributors are compensated for selling the products and the business opportunity. Ayodeji Oladeji Charles: Let me rightly say that God has blessed the two of you together with your children. Someone might be thinking, Why should I be involved in network marketing business opportunity? Do you think that there’s a reason why someone should be involved? Does it really worth getting involved? 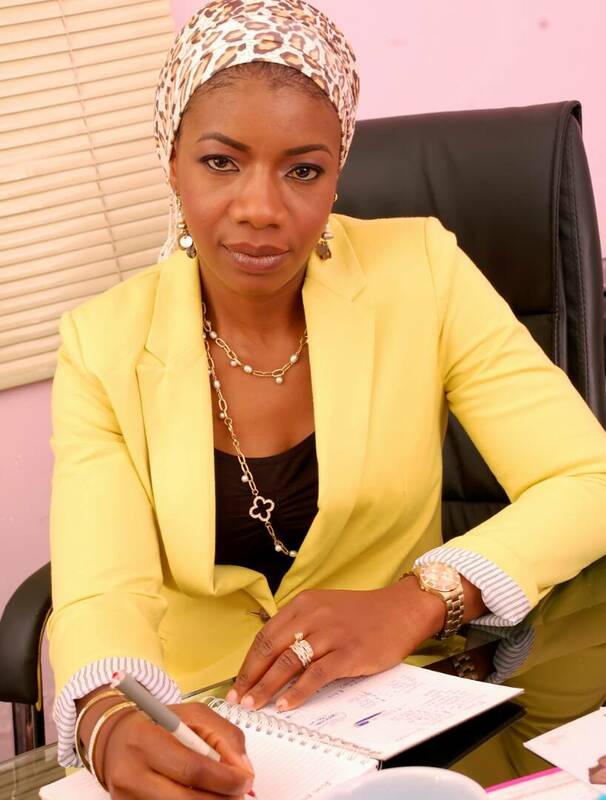 Mrs Kudirat Abdulazeez: I strongly recommend network marketing to EVERYONE. First of all, the start up cost is low when compared to traditional businesses. You can operate your business from home, your time is flexible, you are your own boss and there are no employees. It also eliminates all human barriers. Network marketing does not discriminate. Your educational qualification, gender, age, nationality does not matter. Lastly network marketing teaches you to become an overall better person who raises others to realise their dreams. Its totally worth it! Ayodeji Oladeji Charles: If I can understand you well, you said that the start up cost is low when compared to traditional businesses, some people still find it difficult to be involved in it, why is this happening looking at what you have said, why would someone not be willing to be involved, should we say it’s fear, doubts or ignorance? 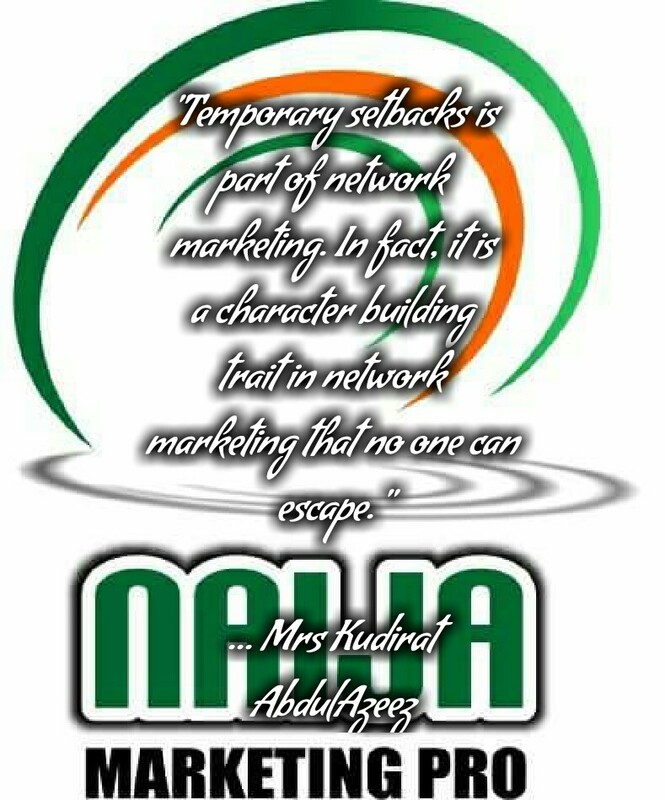 Mrs Kudirat Abdulazeez: I think network marketing is still in its infancy in Nigeria even though the industry has been around for at least half a century now. It’s also greatly misunderstood by most people. A lot of people get their perception of network marketing from what they have heard from other individuals who may have experienced network marketing at some point and who didn’t do their due diligence to start with. Unwillingness to get involved in network marketing stems from misunderstanding in my opinion. There is absolutely nothing to fear in network marketing. Ayodeji Oladeji Charles: How many years have you spent in network marketing? 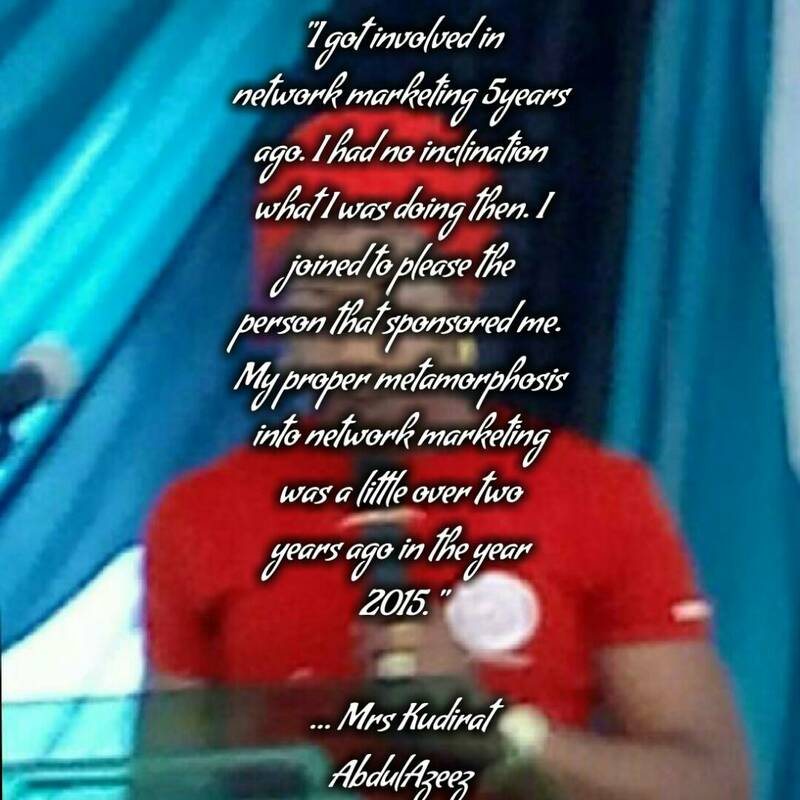 Mrs Kudirat Abdulazeez: I got involved in network marketing 5years ago. I had no inclination what I was doing then. I joined to please the person that sponsored me. My proper metamorphosis into network marketing was a little over two years ago in the year 2015. Ayodeji Oladeji Charles: Hmmmm…. Today, you are a multiple award winner in network marketing business, and a pharmacist by training but, how has it been even as a mother? Mrs Kudirat Abdulazeez: Achievement in any field has its challenges and network marketing is no different. I attended a company event in 2015 and heard several people being called to receive awards. As they walked across the stage beaming wildly, the whole room erupting with applause…I thought to myself “I would walk across a stage and be celebrated too someday”. It was a turning point for me. As a mother, I have family responsibilities which I take very seriously. However, network marketing offers flexibility and I am able to work from home while still taking care of my family. Sometimes it gets a little demanding but my family’s support has helped immensely. Even so, it cannot be compared to the demands of a 9 to 5 job that offers no flexibility where moms have to be away from the home everyday for extended periods. Ayodeji Oladeji Charles: Wow. How do you manage your time? Mrs Kudirat Abdulazeez: Time management am sure is something most people can relate to. We live very demanding lives presently. To succeed in network marketing, I learnt I have to treat it like a real business and give it the attention it requires. It also takes some amount of discipline because no one is monitoring you. Effective time management I learnt starts with a clear visions and goals. Once that was identified, I asked myself how many hours a week I need to get closer to my goals and book the time down in my calendar and stick to the schedules. Ayodeji Oladeji Charles: All the business leaders that I know always mention booking ones activities down on the calendar, I think something must be attached with this calendar as a factor that pulls one closer to achieving his or her goals. So, that’s cool from you. If I may ask, what is the greatest challenge that you ever faced as a network marketer and how were you able to dealt with it? Mrs Kudirat Abdulazeez: My greatest challenge ever was prospecting! Back then, I thought telling people about my company’s opportunity was bothersome to them and I really didn’t want to bother anyone. Further more, it involved asking them to part with their money! So I would partner with a company talk to the few people close to me..then do nothing! My brother who is one of my mentors told me I had it all wrong! He said I needed to change my “mindset”! He encouraged me to read books on network marketing and even gave me a list of books! The first on the list of books I read was GO PRO. A best selling book by Eric Worre. That book taught me it wasn’t about me at all! I had been selfish all along! There are important products and services in the world today that need to be promoted to people who need them. And many companies are using the platform of network marking. So if I would do this, I have to put people first and not my emotions or doubts. When I came to this realization, I was able to overcome my challenge and now I take presentations in front of a group/crowd of people. Its amazing! Ayodeji Oladeji Charles: Amazing indeed, it’s even sounding in your voice. How do you think network marketing is the solution to youth unemployment in Nigeria? Mrs Kudirat Abdulazeez: Thank you for this question. Network marketing is part of the solution to youth unemployment in Nigeria in my opinion. So much emphasis and expectations are leveled on jobs and employment in Nigeria. The awareness of the network marketing industry has increased considerably over the past few years but its still not being harnessed enough. No government can provide employment to all its citizens. In developed societies, it has been observed that small business owners are the bedrock of the economy. Many in such societies run their business from home using the INTERNET and this is their means of livelihood or at the least part of it. Our youths should think of what solutions they can offer in Nigeria. The first step is to research and identify the problems peculiar in our society and leverage on their social circle to bring about solutions. The more people, youths especially that get involved in network marketing, the less pressure there will be regarding unemployment and by extension, it will help other areas of concerns in the country. Ayodeji Oladeji Charles: As one of our purpose in Naija Marketing Pro, I strongly believe if 50% of Nigerian youths as you have rightly said are involved in network marketing, learn the skills and stays with it for a year or so, the issue of unemployment would be solved. But someone may be thinking currently. OK, I will be involved but I don’t have the skills to get the success in it, so, I will like to ask, one after the other what are the 5 keys or skills to success in network marketing in Nigeria. Mrs Kudirat Abdulazeez: Indeed!! There are several parameters which I think should be considered to succeed in network marketing. First the company you intend to partner with is very important. One needs to choose wisely. Distinguish between a legitimate network marketing company vs a pyramid/ponzi scheme. Ask yourself, does the company represent your interests? It has been observed the people will stay with a company they can identify with personally. As an example, does the company promote products you love and can promote with passion? Also, ensure the company is solid. How long has the company been operating? Its also important to favor companies that have physical offices in Nigeria. Ayodeji Oladeji Charles: This is lovely. Facts unveiled. Mrs Kudirat Abdulazeez: Secondly, find a good mentor who has gotten the results you want in network marketing or one who has a dream similar to yours and is working towards it. Its important to note that your success does not depend on your mentor or sponsor. If you want success, find people who have succeeded and model their actions, beliefs and mindset. You have to learn the ropes, fold up your sleeves and get to work. Ultimately decide to do it right. Ayodeji Oladeji Charles: Hmmmm. Please continue. Mrs Kudirat Abdulazeez: Third, its important to focus on what brings in the results you want. Network marketing can get overwhelming… Juggling between all the things it takes to keep your business growing. You have network marketing activities, booking parties, product demonstrations, meetings with prospects, team building etc. Your to do list will keep growing and you will be working hard. But it is necessary to priorities and spend time needed to those activities that define the success you want to achieve and not just being busy. Fourth, leverage on your social capital and have realistic goals. No one can succeed alone in network marketing. Its impossible! You need people. Now, you might say you don’t know a lot of people which is okay but you don’t know all the people those people know! This can produce a ripple effect that keeps growing wide. With the advent of social media, its quite easy to see this ripple effect. Use social media also. However, don’t go barraging your friends and family to see your opportunity. Be a solution provider and when people see that, they will become your customers or join you as a distributor. Its also important to know that not everyone will join. In fact, expect failures and see them as learning experiences and move on. Regarding expectations. When people start a traditional business, they expect to break even in the first few years and possibly pay back their initial investment in 2 to 5 years. But when a person starts a networking business, they expect to get their money back in the first month, make profit in the second and be rich in the third! It does not work that way. Anything worthwhile takes time! Last but by no way the least is Personal Development. Every top earner in network marketing has invested in personal development by buying books, audio programs and even live coaching! This inevitably brings out the better person in you and gives you leadership qualities which helps you succeed and realize your dreams. You need to develop yourself to attract the right people with whom you will build a large team and succeed. Ayodeji Oladeji Charles: Let’s proceed in other to save our time, I observed that females do better than their male counterparts in network marketing, what can you say to that? Why is this so? Mrs Kudirat Abdulazeez: I hope this is not a trick question. Do you ask your male guests this question too… LOL. I think women are more open minded to opportunities. Besides women are renowned for their multitasking skills and men renowned for their lack of multitasking skills (no offense intended). Women are primarily responsible for the smooth running of the home. Work and business comes second and women handle all very well. This is a great quality and strength to have as versatility helps one succeed in network marketing. Whether multitasking is a built in quality or something we women folk learn at an early age is debatable but its sure a great quality to have. Women are good leaders. Women have strengths in communication, empathy, clearer vision, a better perspective and a mature approach. 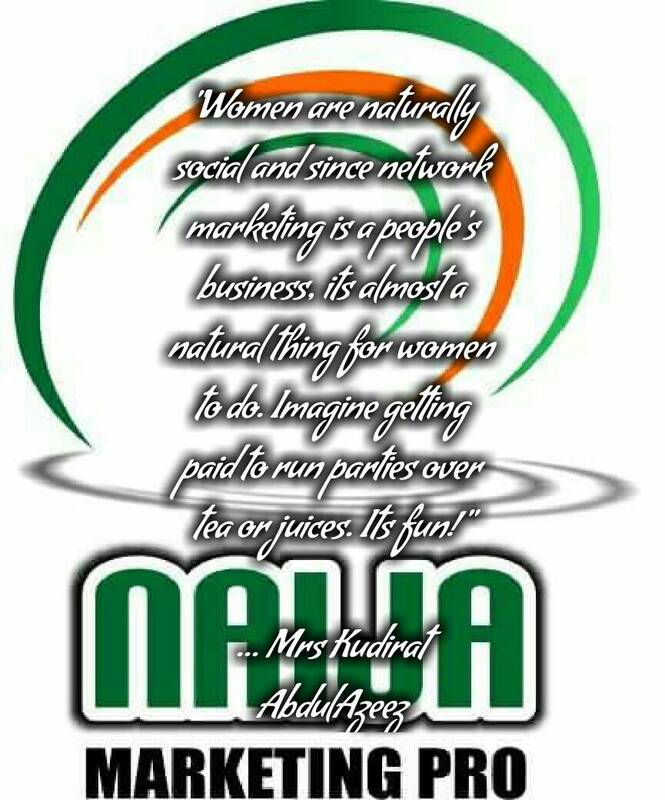 Also women are naturally social and since network marketing is a people’s business, its almost a natural thing for women to do. Imagine getting paid to run parties over tea or juices. Its fun! In addition, women are quick learners, non-intimidating, friendly and it helps to win and influence people to join their teams. Ayodeji Oladeji Charles: It’s never a tricky question, it is what has proved itself several times without number, little wonder, men cannot do without them. Thumbs up to every ladyboss network marketers out there. We’ve seen lots of success stories in this industry but, can you advise a young graduate to start a career in network marketing? If no why? And if yes, why? Mrs Kudirat Abdulazeez: Thank you. You are very generous with your compliments for women. Yes, I would advise young graduates to delve into network marketing. Network marketing helps you become an accomplished entrepreneur which by extension helps you be a good and self motivated employee if you still want to be employed. Network marketing also pushes you to want to have a business of your own. So its a good start for young graduates. Ayodeji Oladeji Charles: What is your advice to the unemployed youths in Nigeria? Mrs Kudirat Abdulazeez: My advice to the unemployed youths in Nigeria is to think outside the box. There are so many opportunities out there to be explored. Its self destruction to sit around and wait for a job that may never come. We are in a new economy presently. There are fewer jobs out there. And they will keep shrinking. More companies are choosing direct sales because it fits the new economy. Companies are paying for performance rather than time spent at work. The earlier we accept this shift, the better. The most important thing to do is to start. Start up investment does not need to be huge. There are some companies that offer start up of below N10,000.00. Ayodeji Oladeji Charles: OK. Thanks for that sincerely. What could make someone to fail in this industry called network marketing? Mrs Kudirat Abdulazeez: Failure can be categorized. It does not have to be permanent. Let me explain what I mean. Temporary setbacks is part of network marketing. In fact, it is a character building trait in network marketing that no one can escape. The only difference is that we don’t look at them as failures but experiences to learn from. From early on, we need to know that some failures would come. A typical example is when most of the people you try to sell your business opportunity to don’t buy into it. It can be very deflating. What do you do? Stop? No way! That is the difference. Ultimately, what would distinguish someone who succeeds in network marketing and someone who doesn’t is how many times they pick themselves up after setbacks. I should mention though that there are some things that prevents people from succeeding in the real term of failure. They include, frequently changing companies, lack of personal development, lack of commitment, pitching oppourtunity first before building relationships which seems desperate and people see through this and having an employee mindset. Ayodeji Oladeji Charles: Personally, I have observed that people changes company if they observed that the success they wanted weren’t coming, another I have observed is people promoting two companies same time, which is bad. What do you like to do outside of work? Mrs Kudirat Abdulazeez: Outside work I love exercising, reading, dancing and listening to music. Ayodeji Oladeji Charles: Awesome. What encouragement/words do you have for Naija Marketing Pro Community? Mrs Kudirat Abdulazeez: First, I would like to commend everyone in Nigeria that is involved in network marketing and that is upholding the ethics of the profession. We still have hurdles to scale. Let’s keep keeping on till everyone hears about our great industry. And to you, Ayodeji Oladeji Charles and the entire Naija Marketing Pro Community, a huge appreciation to you for what you are doing. Ayodeji Oladeji Charles: All of us at Naija Marketing Pro says thank you for creating a time out of your own busy scheduled to have this conversation with us today. We hope this will definitely impacts some youths and it will let them be aware that they can take full ownership of their lives. Because it is a stone cold fact that, if you can conceive it and believe it, you can achieve it. 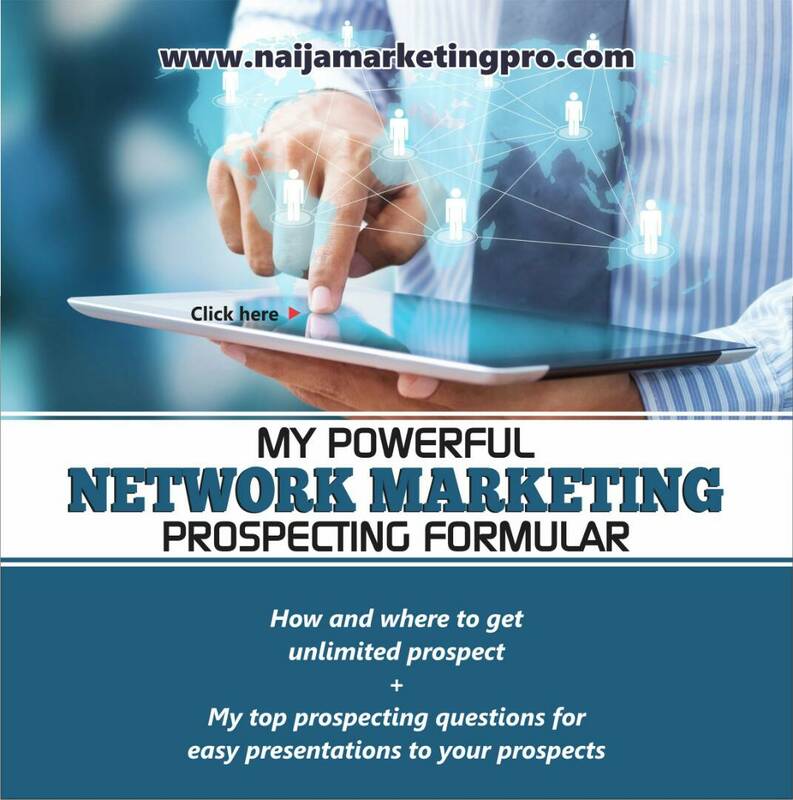 Ayodeji Oladeji Charles : There we go again everyone, my wish for you is that you decide to become a Naija Marketing Pro because with network marketing, you can take full ownership of your life. « A SIMPLE MISTAKE MADE BY SOME PEOPLE IN NETWORK MARKETING BUSINESS OPPORTUNITY, DON’T MAKE IT. This is really mind blowing. Thanks Mrs Kudirat, AOC and Naija Marketing Pro Community for impacting in the life of Nigerians. Remain Blessed. A beauriful and information filled piece. This shows Nigeria is certainly developing and taking forward strides in the area of network marketing. Its also great to know that Naija Marketing Pro is at the forefront of this movement. You are pioneers indeed!